Thanks to Relevant Children’s Ministry for this re-post. The easy thing to do is to quickly place the blame on a child when he or she is misbehaving in class. While it is true, we all have a rebellious nature we acquired from the fall that can cause us to misbehave on our own free will at times, it is also true in many cases, children misbehave because of circumstances we or someone else has placed them in. If we can eliminate or teach them how to work through those circumstances, the amount of times kids misbehave in our ministry can be significantly reduced. Let’s take a look at 10 reasons why kids misbehave because of circumstances and how we can adjust these circumstances to help them succeed. #1 – Kids misbehave when they are bored. Kids hate to be bored. And let’s be honest. Adults hate to be bored as well. I recently visited a church as a guest and to be honest, the delivery of the sermon was very boring. Monotone. Too much information with no significant points to remember. No stories or illustrations. I looked around at the crowd and it was obvious they were “enduring” the message. In fact, I noticed that many of them were looking down at their phones throughout the message. And these were adults. They didn’t “misbehave” because they were adults. But place kids in that situation and they will have a hard time not misbehaving. If you are having trouble with kids misbehaving, I want to challenge you to take a hard look at what you are doing. Pull aside a few kids and ask them if they get bored. And you may have to let them be anonymous in their responses to get a true answer. Blues Clues has been called the most engaging children’s television show ever made. Do you know why? Because before an episode ever made it to the air, the producers would bring in groups of kids and have them watch a preview. They watched the kids during the preview and when the kids looked away or got restless, they made a note of it. They knew when kids get bored they get restless and start looking around. The producers then went back and adjusted those parts of the show to make them more engaging. Bored kids misbehave. Engaged kids behave. If you have a boring lesson or service, kids will make up their own fun, engaging lesson and service by misbehaving. #2 – Some kids misbehave because they have a medical condition. Usually parents will let you know when their child is experiencing a medical problem that affects their behavior. Be sensitive to the child’s needs and work closely with the parents to provide the best experience possible for the child. In some cases, it might mean providing a one-on-one volunteer to help the child. Jesus calls us to demonstrate patience, empathy and understanding. #3 – Kids misbehave when they are being taught through a lecture-only model. The more you lecture, the more kids will misbehave. Kids (and if we were honest – adults too) are wired to learn not just through lecturing, but through other learning styles as well. In fact, lecturing is the least effective way of teaching. Kids forget 90% of what they only hear. But when you add in activities, games, hands-on learning and discussion, what they remember skyrockets. If kids are misbehaving in your ministry, take a hard look at how much lecturing you are doing. Shrink the amount of time you are lecturing and your behavior problems will shrink as well. #4 – Kids misbehave when they are experiencing turmoil or stress at home or in some area of their life. Countless times when I a child has been misbehaving, I have found out that he or she’s parents are going through a divorce. The misbehavior was the symptom of the root cause. I remember another child whose behavior at church suddenly began to go downhill fast. As we worked with the parents to find out why, it later came out that he was being abused. This is why his behavior had changed for the worse. When a child, who was doing well in class, suddenly starts acting out, connect with the parents or guardians and ask if there is anything troublesome going on in the child’s life that might be causing it. Walk with the child and family and provide support and encouragement as you can. #5 – Kids misbehave when they are being taken past their attention span. How long is their attention span? About 1 minute for every year of their age. In other words, you have 3 minutes with 3-year-olds. And it maxes out at 5 minutes. This primarily relates to the lecturing we talked about in #3. Watch the next time you are teaching. After a few minutes, you’ll notice kids start getting restless. The solution? Simply reset their internal clock every few minutes. That means if you are teaching, after 3 minutes of you talking, stop and let them talk about a discussion question for 3 minutes. Or after you’ve taught for 3 minutes or so, break it up with a quick game or activity. If you will honor kids’ attention spans, you will see your behavioral problems become almost non-existent. #6 – Kids misbehave because they want attention. This is one of the biggest reasons younger children misbehave. If they can’t get positive attention, then they will act out to get negative attention. But the goal should be not to eliminate the need for attention. Kids need attention. And they should get it at church. Why? Because they need to know they matter. Because they need to know that there are adult volunteers who care about them. Because discipleship happens through personal relationships. In order to do this, you must have good ratios of kids to volunteers. If there are two volunteers in a room with 40 kids, it’s going to be nearly impossible to give kids personal attention. And the ones who really need it, will begin to misbehave in an effort to get it. What they can’t verbalize through their words, they will demonstrate through their actions. They will do anything they can to get your attention. When we respond to negative behavior, we give kids negative attention. This may come in the form of lecturing the child, moving the child to another part of the room by himself / herself, threats, interrogation or taking away something important to the child. But here’s what we must remember. Negative attention only increases misbehavior. We must replace the negative attention with positive attention. #7 – Kids misbehave when they are testing the boundaries. As kids try to figure out the world they live in, they will try to find out where the boundaries are. It is natural for us to do this. Where there is a fence, we are drawn toward leaning against it, aren’t we? This gives us a great opportunity to make a difference in children’s lives as we set boundaries and limits and follow through on them. #8 – Kids misbehave when they are seeking control. Kids have very little control in their life. They are normally told what to do, where to go, when to go to bed, what to wear and how to act. As they seek control, they will misbehave at times. Don’t let this lead to a power struggle. You can avoid this by offering the child choices. An example would be giving kids choices between activities in class or if they misbehave, offer them options to correct their behavior. When you do this, you will reduce a lot of confrontations and increase the likelihood that children will follow instructions. #9 – Kids misbehave because the rules and guidelines haven’t been made clear. Don’t expect kids to follow rules and guidelines that they don’t know exist or haven’t been communicated clearly. A great way to accomplish this is by stating the rules and guidelines at the beginning of the class. And here is a small tweak that can be a big help. Start by not calling them “rules.” When kids hear the world “rules” they immediately think of something negative. Flip this and call them toward positive behavior. Here’s an example. When I lead a class, I give the kids these 4 ways they can be successful in class. Talk when it’s time to talk. Listen when it’s time to listen. Get involved in the games and activities. Which leads to the final reason kids misbehave. #10 – Kids misbehave because of lack of motivation. This happens when we don’t give kids a good behavior goal to aim for and a reward for hitting that goal. Look back at the positive rules in key #9. When you share these rules at the beginning of the class, show the kids what they can obtain if they hit those goals. It might be an extra game, candy, recognition or some other type of reward. Here’s another tip. Have kids work together as a group to meet the goals and then reward them as a group for meeting the goals. This adds the element of positive peer pressure. In conclusion, here are 10 questions to work through with your team. The answers you generate will help you see kids behave better and have a better experience in your ministry. 1. How can we do a better job at making our services or class time more exciting for kids? 2. Are there any kids in our ministry who are misbehaving due to possible medical conditions? How can we come alongside them and their parents? 3. How much time are we spending lecturing kids? Do we need to reduce this? 4. 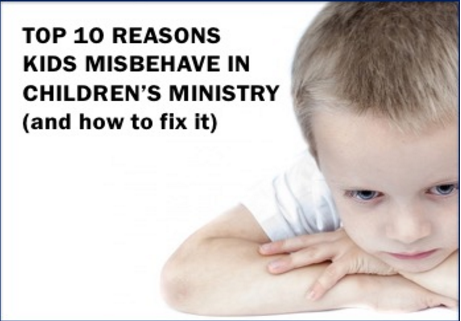 Are there any kids in our ministry that are misbehaving due to stress or turmoil at home? How can we help them and their parents during this time? 5. Are we honoring kids’ attention spans? How can we improve in this area? 6. Are we providing kids with positive attention? Are our ratios conducive to this? 7. Do we understand that kids test boundaries? Are we setting clear boundaries and being consistent with them? 8. Are we giving kids the opportunity to exercise control by providing them with choices? 9. Are we providing kids with clear, understandable rules and guidelines to follow? 10. Are we motivating kids toward good behavior? How can we improve in this area?